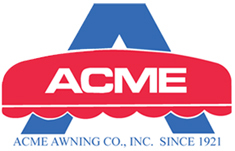 Acme Awning Co., Inc. was established in 1921. We specialize in custom awnings and canopies for private homes and penthouses, commercial awnings for restaurants, hotels, retail stores, country clubs, residential apartment entrances, government buildings, and more. We are a second generation owned and operated business. We give personalized attention to our customers, and go out of our way to make sure the customer is satisfied with our product. We warranty our product for one year from date of installation. If you have a problem, we respond. We stand behind our work. Word of mouth recommendations are a strong part of our business. Acme Awning Co., Inc. serves the Tri-state metropolitan New York area. Our target clients include upscale specialty retail shops, restaurants, commercial reality buildings (residential apartments), architects, interior designers, and construction companies. We have one of the largest factories in the Tri-state area. We do all work in house, from sales to design, manufacturing, and installation. We are always upgrading equipment to have the latest technology. The owners have over 100 combined years in the industry. Acme is also a member of IFAI, the Industrial Fabric Association International and PAMA, the Professional Awning Manufacturers Association.